The Moyie River is an exciting, but relatively unknown, whitewater day trip in North Idaho. 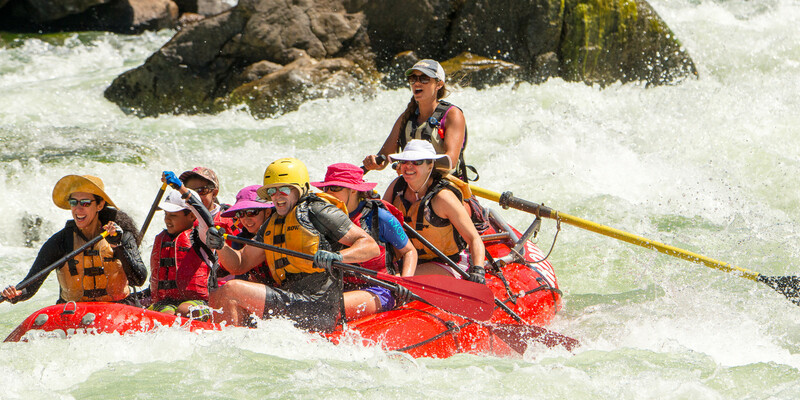 With Class II-III whitewater, the Moyie is a great introduction to the area's wildlife, scenic beauty and exciting river rafting. The Moyie River floats through a secluded wilderness canyon and is within two hours of Spokane, Wash. and Coeur d'Alene, Idaho. ROW's whitewater day trip floats 15-miles of the Moyie. It's a great escape for area guests and locals, and is one of the best kept secrets of Idaho rafting day trips. The Moyie River, one of Idaho's best kept whitewater rafting secrets, is an adventure not to be missed. ROW pioneered these 11-15 mile rafting trips on the Moyie River in 1981, and every spring we delight in sharing this hidden whitewater rafting jewel with guests of all abilities. The Moyie is a tributary of the Kootenai River and flows south through a remote wilderness canyon in North Idaho. Its Class II-III whitewater cascades through a lush cedar forest and bounces our paddle rafts through a seemingly endless succession of galloping rapids. The Moyie River is a whitewater rafting day trip filled with excitement, scenic beauty, wildlife and action-packed whitewater. ROW uses paddle rafts on the Moyie River, so you're an integral part of the action as we travel through the whitewater rapids. During higher water flows, we use 14' self-bailing rafts, and as the water lowers, we switch to smaller 13' rafts to maximize the excitement. We usually see osprey, mergansers and songbirds when floating through this secluded wilderness canyon, and occasionally we'll spot a moose, bear or harlequin duck. The Moyie River is less than two hours from Spokane, Wash. and Coeur d'Alene, Idaho, and is just 40 minutes north of Sandpoint, Idaho. ROW Inc., doing business as ROW Adventures is proud to be an Equal Opportunity recreation service provider. ROW Inc. operates under special use permit from the U.S. Forest Service in the Panhandle National Forest. All our operations and facilities are operated on a non-discriminatory basis.